Arrow Video has announced that John Carpenter's iconic cult classic Big Trouble in Little China will be released as both as a deluxe Blu-ray and a limited edition SteelBook in December. Kurt Russell plays Jack Burton, a reasonable guy who is about to experience some unreasonable things in San Francisco's Chinatown. As his friend's fiancée is kidnapped Jack becomes embroiled in a centuries-old battle between good and evil. At the root of it all is Lo Pan, a 2000-year-old magician who rules an empire of evil spirits. Jack goes to the rescue dodging demons, goblins and the unstoppable Three Storms as he battles through Lo Pan's dark domain. One of Carpenters most enjoyable and best loved films, Big Trouble in Little China juggles delirious set-pieces, comedy and kung-fu action with a sharp script of memorable one-liners, as Jack would say "It's all in the reflexes." "Big Trouble was a dream come true, it's such an iconic film and to be able to work on a new version of this was a real treat. Technically one of our most complicated discs with acres of content to fit in whilst making everything easy to navigate and user friendly our technical team made this all seamless on the final disc and we are really pleased with the final presentation. The film's restoration from Twentieth Century Fox was a gift, it's never looked so good and we can't wait for our fans to enjoy this package for Christmas." 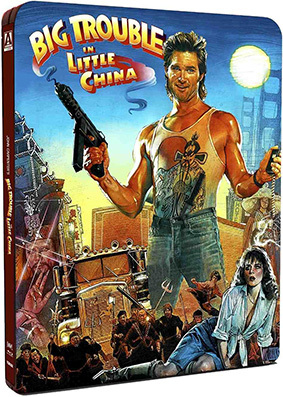 Big Trouble in Little China will be released on UK Blu-ray on 16th December 2013 by Arrow Films at the RRP of of £19.99 for the Special Edition Blu-ray and £24.99 for a Limited Edition Steelbook featuring Drew Struzan’s iconic artwork.